Thoroughly clean can and dry — Paint or decoupage the outside of can with a unique design — Seal with polyurethane — You will need a (minimum size of) 18 inch galvanized bolt (about 2.50 at a hardware store) with a washer and nut. Puncture hole in bottom of can and push the bolt through from the inside of can until head in at the bottom. Under the can on the bolt add a washer and then secure the nut tightly. The longer bolt you use the better. You can also polyurethane the entire can, nut, washer and bolt once done to give a nice shiny presentation and to help prevent rust. 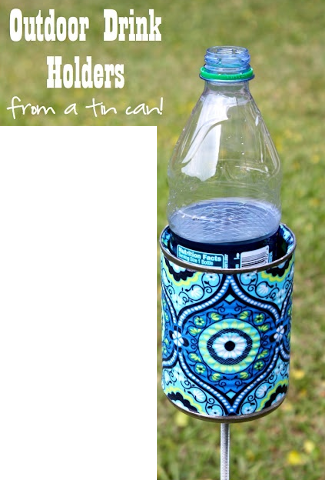 This entry was posted in Crafts ~ DIY ~ Projects, Home, Car, Yard, and Pets, ~Decoupage, ~Home and tagged beer, bolt, Bottle, can, craft, crafts, drink, easy, Hardware, Hardware store, holder, Home and Garden, Home Improvement, Materials and Supplies, nut, paint, relax, Shopping, soda, washer. decoupage. Bookmark the permalink.